Institute of Banking Personnel Selection, IBPS has released the notification for IBPS PO 2018 recruitment examination. The notification for IBPS PO 2018 has been released on ibps.in. Candidates who aspire to take up probationary officer jobs in various national banks are required to appear for the IBPC PO Exam 2018. The recruitment includes a preliminary and main examination followed by an interview. As per the calendar available on ibps.in, IBPS PO Prelims 2018 would begin from October 13, 2018. IBPS PO 2018 Notification released between August 10 and August 13. The institute usually provides a window of 20 days for candidates to fill the online application forms. The admit cards are released about three weeks ahead of the examination. Considering the exam dates, the PO notification are announced. Candidates may keep a check on this page for latest updates on the IBPS PO Notification 2018. Also, the eligibility criteria usually do not change much for the examination. The selection process for IBPS PO includes a preliminary online examination followed by a main examination and an interview. The preliminary examination is qualifying in nature and the marks of the same are not considered while creating the provisional selection list. The procedure of recruitment from release of notification to the publication of the final results often extends for about 6 to 8 months. 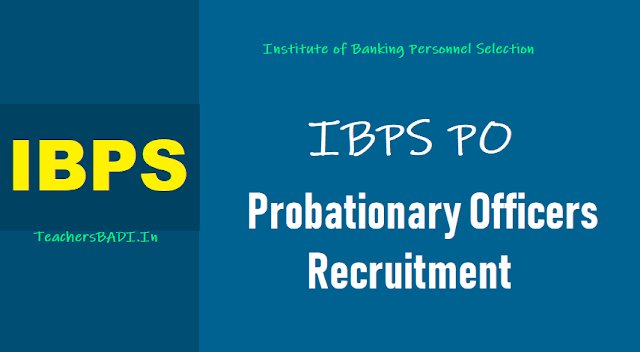 IBPS 4102 Probationary Officer/ Management Trainee Posts :Institute of Banking Personnel Selection(IBPS) invites applications for the online examination (Preliminary and Main) for the next Common Recruitment Process for selection of personnel for Probationary Officer/ Management Trainee posts in the Participating Organisations is tentatively scheduled in October/ November 2018. Age (As on 01.08.2018): 20 to 30 years. Selection: Online Preliminary examination, Online Main examination, Interview. Application Fees: Rs. 100 for SC/ ST/ PWD candidates. Rs. 600 for all others. Andhra Pradesh: Preliminary Examination Centre: Chirala, Chittoor, Eluru, Guntur, Kadapa, Kakinada, Kurnool, Nellore, Ongole, Rajahmundry, Srikakulam, Tirupati, Vijaywada, Vishakhapatnam, Vizianagaram. Main Examination Center: Guntur, Kurnool, Vijaywada, Vishakhapatnam. Telangana: Preliminary Examination Centre: Hyderabad, Karimnagar, Khammam, Warangal. Online registration including Edit/ Modification of application: 14.08.2018 to 04.09.2018. Payment of Application Fees/ Intimation Charges (Online): 14.08.2018 to 04.09.2018. Online Examination – Preliminary: 13.10.2018, 14.10.2018, 20.10.2018 and 21.10.2018. Online Examination – Main: 18.11.2018. IBPS Probationary Officer/ Management Trainee recruitment for 2019-2020: Institute of Banking Personnel Selection (IBPS) has released official notification for Probationary Officer/ Management Trainee recruitment for 2019-2020. Online registration will begin on August 14, 2018. A total of 4102 vacancies for PO/ MT posts have been notified by IBPS in 20 participating organisations. The preliminary exam will be held in October and the main exam is scheduled to be held in November. Provisional allotment for the IBPS PO recruitment will be completed in April 2019. Interview for the PO/ management trainee post will be held in January/ February 2019. Graduates in the age group of 20-30 years are eligible to participate in the IBPS PO recruitment. 'All the educational qualifications mentioned should be from a University/ Institution/ Board recognised by Govt. Of India/ approved by Govt. Regulatory Bodies and the final result should have been declared on or before 04.09.2018,' reads the job notification. IBPS will select candidates on the basis of preliminary exam, main exam and interview. In order to qualify the prelims and main exam, candidates have to qualify in each of the tests in the exams. For prelims, questions will be asked from English language, quantitative aptitude and reasoning ability. Likewise for main exam candidates shall have to attempt questions from topics: reasoning and computer aptitude, general/ economy/ banking awareness, English language and data analysis and interpretation.